It arrived quickly and when fitted started first time. It does what it says as per instructions. Good deal. Superb battery. Already charged. Delivered in less than 24 hours and cheaper than anywhere else. 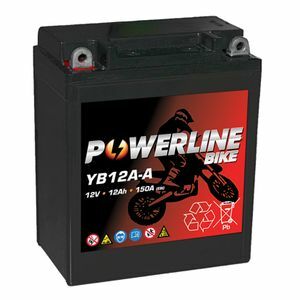 AGM battery with quick delivery and s good price, what's not to like! Seems like a good battery. It's been on the bike for 18 months without any problems. Although the bike is not heavily used, just weekends during summer. If you are thinking of buying a battery then this is the place to go to. Not only are they great value but the sales and after sales service are second to none. I highly recommend Tayna. Quick delivery. Great product at a good price. Great power bank, excellent starting power and keeps charge for long period, accurately sized to original spec and polarity. Excellent delivery service and fits my bike perfectly. As for performance and longevity the jury is still out. Absolutely superb service. Things went wrong with the delivery agent, all sorted by Tayna batteries without any fuss. Highly recommended. Delivery was under 24 hours. I have used Powerline batteries before and find they are a must when you need to replace your battery. All good, next day delivery and perfect packaging. Seems to hold a charge better than lead acid and holds above 13 volts so more crank power.Time will tell as bike batteries don't last like car batteries! Brought my bike instantly back to life! After installation, left on Oxford Oximiser overnight and it started strongly in cold weather. Very pleased.